The secure, reliable, available, bespoke service. ‘The cloud’ refers to the storage and access of your computers data and applications via the internet. Previously, this information was stored on your computer’s hard-drive; however our cloud services allow you to access your files from anywhere. What makes our cloud services different? Cost effective– Save money on idle computers as you only pay for what you use. Also you will not have to spend money on hardware, software or licensing fees resulting in low upfront costs and fixed on-going costs. Access any files any time, from any location – As long as you have an Internet connection, you can access your files from any location. 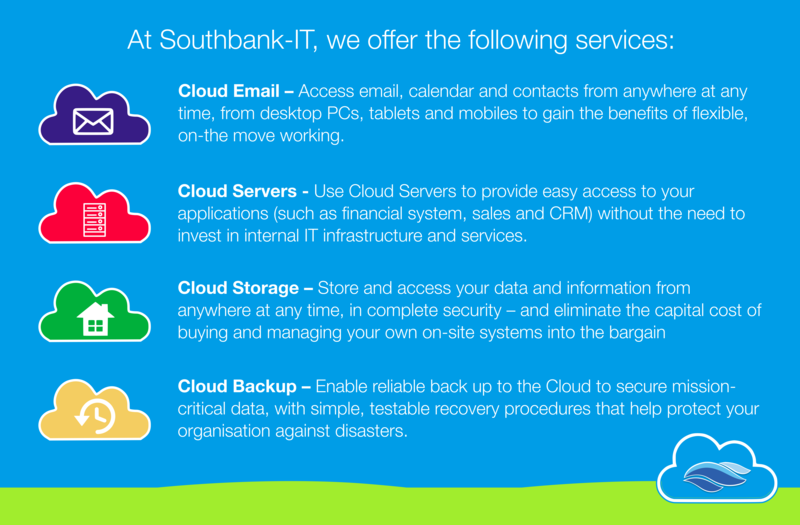 Southbank-IT has the expertise to help make the move, and to manage and exploit the Cloud for maximum benefit. Based on the offer of lower costs, zero capital expenditure, and greater reliability and security, businesses of all sizes are now moving services, applications and data to the Cloud.